The embattled nation of Fredonia must strike back at its invaders with a new top-secret weapon. Only one thing can put an end to this terrible war, Daylight Precision Sausage Bombing! Sweep areas clean of enemies by dropping an assortment of cured meats: slippery kielbasa, Vienna sausages, Scottish haggis, and more. Complete your missions by triggering ridiculous physics-based chain reactions of explosions! Behold the power of the Atomic Sausage! 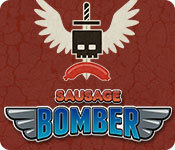 Sausage Bomber is rated 2.8 out of 5 by 8. Rated 5 out of 5 by diamond71977 from Neat little game! I liked it! The only thing I would like more about it would be if there were a way to get past a level if you can't win it. You can buy an atomic sausage for the ultimate in winning the level. There are a lot of options for purchase with accumulated game points that haven't been released on my game, maybe because I don't have enough points, since I had bought two atomic sausages at different times. It looks like you can replay a level to get a better score, although I have not tried that yet. For me, it has replayability, and I'm glad I bought it, even if I got it on a half-price sale. I think it's worth the full member price. Rated 4 out of 5 by ladyblu11 from just plain ol' fun Angry Bird wannabe? maybe, but I don't care. 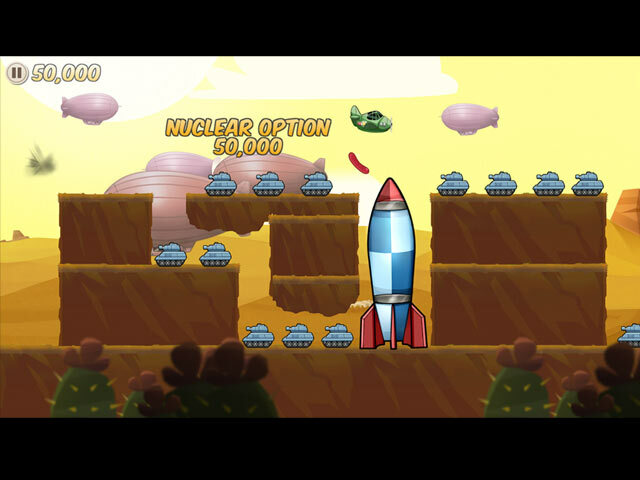 It's a cute game: "general purpose sausage bombs, approved for all combat situations." Bouncy cocktail hot dogs, sliding kielbasa... come on - just plain ol' fun to while away some time with. There are some very challenging levels, but it's fun trying to figure out the right combinations. Worth spending a credit on, for me. Rated 4 out of 5 by bigfelixfan from Surprisingly addictive! 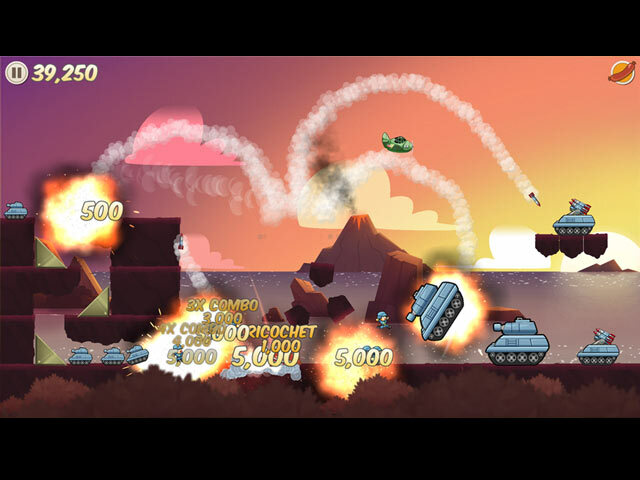 Does use the Angry Birds knock-stuff-down game design, set in a war zone/battlefield/bomber mission environment. Looks like there are hundreds of missions, each a little more difficult, and each with a different bomb, uh, sausage, type to drop. 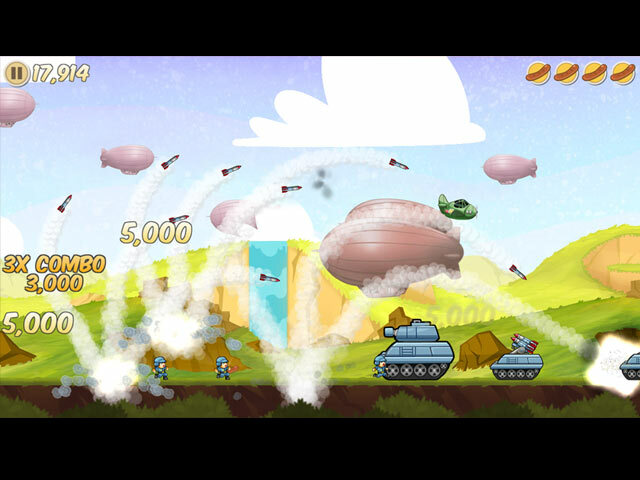 You control when to drop in order to wipe out all the enemy tanks, missile launchers, rockets and helicopters. Sounds kind of silly and I thought I would just play the first 'mission' to see how the game worked. I was quite surprised when the demo ran out after an hour. Have no idea what you can do with the points accumulated in each raid, but there is an indication you can purchase a super weapon to completely destroy the enemy if you find you are unable to complete your mission. There is a do-over button if you fail a mission, so once you understand the geometry of the enemy setup from the first (or in some cases, second) attempt, you can try again to get a "One-And-Done" bonus. I am surprised I liked it as much as I did. Rated 4 out of 5 by campingramps from OH NO!! We're being bombed with sausage! Finally, a game that is actually fun to play. Simple skills needed to drop the sausage at the right time and blow up all the tanks. Different types of sausage "bombs" makes it interesting and I love the little soldiers running. Some of the levels take 3 or 4 retries to figure out what needs to be done but nothing too difficult. I'm sure the real challenges will come later. This game is similar to the wreck the castle game on Armour Games (I think) and I'm anxious to buy and get back into it. You might say I'm hooked and this is my new go to leisure game. I highly recommend this game if you want something to kill some time and have fun in the process. Rated 2 out of 5 by CyndiLouWho2 from Appeals to kids I'm sure I give this cheesy little game 1.5 stars which I generously rounded up to two. I'm not sure why we're being handed all these tablet or phone games lately, but it's getting tiresome. There's nothing about Sausage Bomber that makes me want to part with my money. Graphics are poorly drawn and childish so I'm assuming this is a game more for kids. The music is so terrible I turned it off. Game play is really touchy so there's a ton of extra clicking. And this is supposed to be a strategic type of game, but it's really not. As someone else mentioned, you can play a level exactly the same a bunch of times and you will get a totally different outcome each time. Just too frustrating to play. Guess it's time to delve into some of my old, high quality games and replay those. Rated 1 out of 5 by pennmom36 from NOT EVEN IF IT WERE FREE I love physics-based games that require you to set a chain reaction in motion to destroy all obstacles, preferably on the first attempt, but this game is horrible. The graphics are old-fashioned, the attempted sarcastic humor isn't really funny, and there's really no specific set point to make this a true physics-based game, it's a hit-or-miss tactical game. As a general rule of thumb, if you hit the targeted area in the sweet spot zone, it will cause a chain-reaction that cause everything to come tumbling down, or in this case, destroy all of the opposing forces such as tanks, missiles, crates ammo etc. Some levels it does indeed occur, most levels, however, have no sweet spot. You can replay a level 50 times in a row, doing the exact same maneuver as before, and get an entirely different outcome every single time, even though the Sausage Bomb hit the same exact spot. It takes too long and too many "click here's" to actually start the level, too long to wait for the chain reactions, and too long to replay the level, which adds up to a very unprecise and boring not-so-physics-based game. Rated 1 out of 5 by coolmom4 from Nope! Played less than 2 minutes, terrible game, a wannabe angry birds that fails on every level. Not worth the effort of even downloading. Bad music, bad graphics.